The purpose of this website is to guide you towards a good cup of tea, as you know. And rest assured anywhere that serves a poor cuppa will not get a write-up. But it's not just the tea that gets a place on here - it's helpful if the café in question offers a little something extra, or has a unusual selling point. And Pop's Place certainly does. 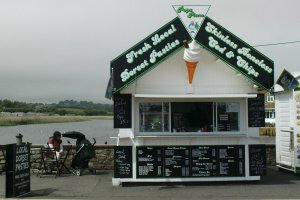 Pop's nestles on the estuary wall in Bridport's West Bay harbour, the last in a line of similarly painted fish'n'chip establishments. I say establishments, but these really are (and I don't think the proprietors will mind me saying) not much more than sheds. Nicely decorated and very well maintained sheds, but sheds nonetheless. Let's get the tea out of the way first. It's hot, strong and served in a good sized mug - it's not high-falutin' (it's PG Tips, as it goes), but it tastes good as you sit at the little table next to Pop's and survey the harbour scene. You help yourself to milk from a jug, and put as much or as little sugar in as you like whilst at the counter, so you can tailor the tea to your exact preference. There may not necessarily be massive choice, but the tea they serve here is great tea. The service is great too, friendly and welcoming, from the proprietor and, I'm guessing, his daughter. Yes, this may be a tiny establishment, but it feels big-hearted. So what are the unusual selling points I mentioned earlier? Well, it's the range of food accompaniments to have with your tea, all of which are perfect seaside fare. First is the fish'n'nchips - I am reliably informed that the cod is excellent: skinless, boneless and in a wonderfully light batter. Then there are the Dorset pasties: locally made, with locally sourced ingredients, these are excellent. The lamb and mint is good but the steak and stilton is spectacular, and I would recommend this in an instant. Then there's the volcano ice - a dessert confection consisting of a warm doughnut with ice cream, sauce and sprinkles. This, I think, is bound to keep the kids happy. So, you're at the seaside and you want a decent cup of tea, and while you're about it you fancy something to eat too, something suitably decadent, unhealthy and, let's be honest, seaside-y. Pop's Place covers all these options in some style, and serves it all up with a friendly smile and a bit of a chat. What more could anyone want? Great tea from a great shed!